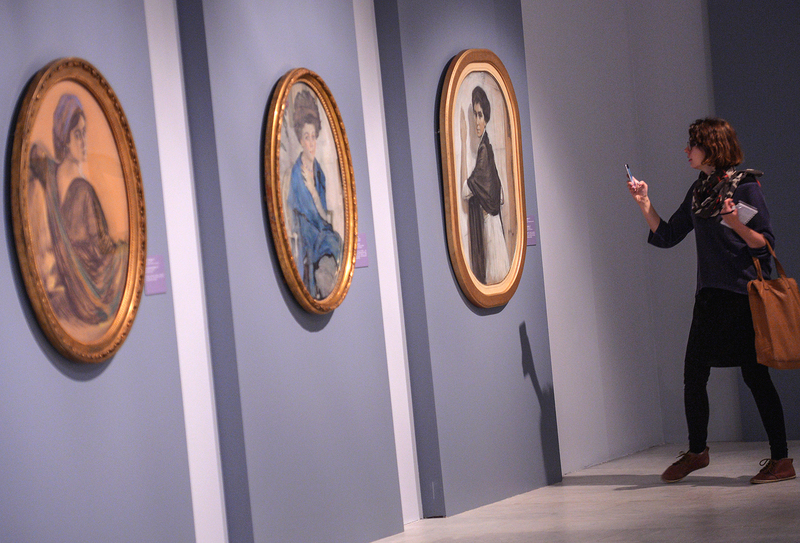 Photo: A visitor observes the paintings 'Portrait of Henrietta Girshman' (1911), 'Portrait of Yelena Oliv' (1909) and 'Portrait of Sofia Olsufyeva' (1911) at the 'Valentin Serov. Towards 150th birth anniversary' exhibition in the State Tretyakov Gallery on Krymsky Val in Moscow. Want to learn more about Russian art in the comfort of your own home? Or pick up a virtual tour guide to show you around Russia’s art museums? These five smartphone apps will help you to become more of an authority on the paintings, sculptures and architecture produced by Russia’s greats. This educational app aims to introduce users to the riches of Russian art. The app’s description talks of the importance of Russian literature and philosophy on the world stage, but the app itself is devoted only to paintings and icons. There is a large selection of works available for viewing. The app is ideal for those wishing to make their first steps into the world of Russian art. Users can save images that appeal to them on their device and share them with friends. Besides the standard functions, which include descriptions of the works and a zoom function, you can also “compare” images and test your knowledge with the help of quizzes. This app allows users to access a vast selection of Russian paintings alongside descriptions of the works. The notes explaining the works and their creators are short, but the information provided should be more than enough for someone making their first acquaintances with the subject. A free version of the app includes 200 works by 100 of Russia’s best-known artists, including Aivazovsky, Kandinsky and Malevich. The full-price version contains around 1,500 paintings in high definition. There are several possible ways of viewing the images – they can be sorted by century, genre or artist. The app’s developers have also added some interactive content: Images can be shared via social media, sent by email or saved onto the user’s device. All the functions are easy and convenient to use. The app is also available in English. The app for Russia’s largest museum, the State Hermitage Museum in St. Petersburg, offers a selection of virtual tours, in addition to providing information about the museum, things to see and ticket prices. Of course, most of the tours are devoted to world art: The Hermitage is amongst the world’s top five art galleries for its general art collection. Yet Russian art is also well represented. Even if the Russian painting component contains fairly little of interest, there is much to be found in the collections dedicated to Russian architecture and fashion. Thanks to the information available in the app, users can learn not only about Russia’s art, but also about the country’s history. This is a collection of multimedia guides divided into two sorts: street tours and museum tours. The app uses a GPS-navigation function, and an audio guide automatically starts playing when the user reaches particular points along various tour routes. Why have we included this app in our list? The app has guides to most of the major world museums, including Russian museums or museums containing Russian paintings. As well as tours, it contains audio descriptions of a selection of individual exhibits. To learn about a particular artifact, all you need to do is open a map, find an interesting museum (note that the app covers attractions in smaller towns as well as museums in capital cities), and start admiring the exhibit. This app takes a more playful approach to studying art history. The app’s design is simple: The user is shown an image and has to select the image’s artist from four possible contenders. In addition to the game, the app contains a large selection of works by Russian artists, from icon painter Andrei Rublev to Wassily Kandinsky.